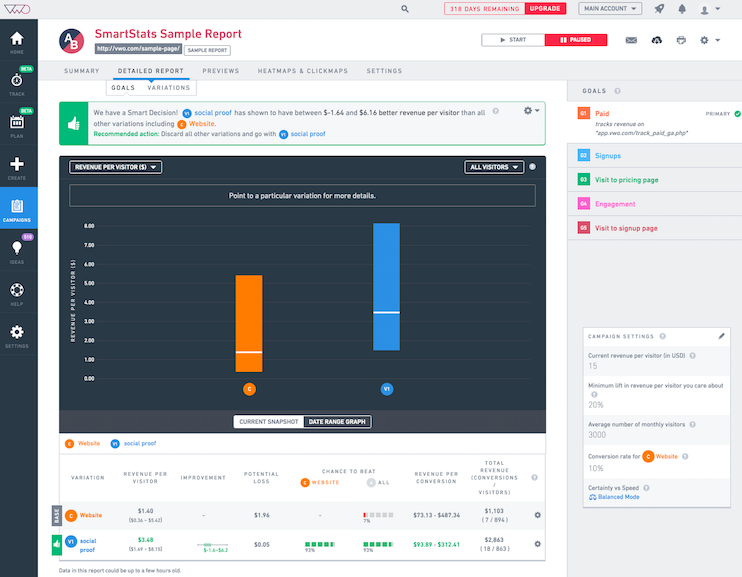 VWO Review: "Multivariate and A/B Testing Done Right"
We leverage VWO's multivariate and A/B testing capabilities to improve conversion rates for our clients across the country. The detailed analytics and high level of customization make VWO a great platform for our CRO services, and our clients appreciate the simple reporting we can provide on results and recommendations. VWO's adaptability and customization options allow us to tailor our tests to very unique scenarios. The overall ease-of-use of the platform allows us to quickly build and implement tests, without specialized coding knowledge, which means faster results for our clients. The user interface within VWO does take a bit of time to get used to, especially as it pertains to switching back and forth between tests. When running multiple experiments on a site at a time, a clear and succinct dashboard for everything in one place would be helpful (as opposed to needing to switch between A/B, multivariate, etc). VWO is a great option for agencies when conducting conversion optimization testing, as it is a relatively intuitive and easy to use platform with a robust set of capabilities. 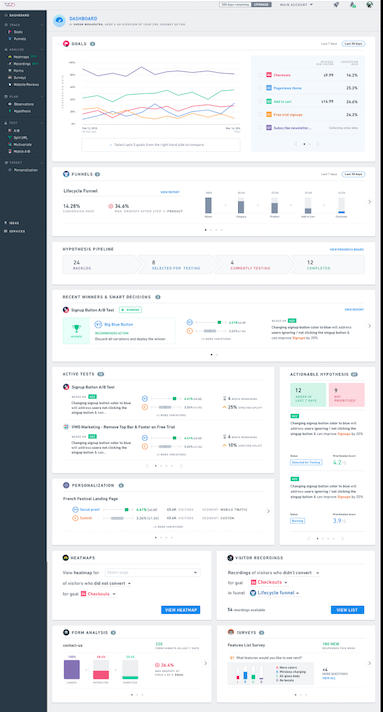 VWO Review: "The perfect tool for marketers wanting to take control of testing"
VWO is mainly used within the marketing and IT department as a tool to increase website conversion. VWO allows us to quickly test researched hypotheses with the results changing our development priority. The management of VWO is split between the marketing function and IT, meaning everyone has full sight of what is currently being tested on our main consumer website. Easy to use UI, you don't have to be a developer. Any advancements on the split testing are also welcome. Integration with Formissimo would be beneficial! I would say to anyone that VWO is best used to help build a business' case for the change on a website or run split testing. For example, simple A/B testing like language or placement changes to a key CTA is what VWO does so well. As a nontechnical person, it's built in such a way that, even if all the implementation is beyond me, I at least feel like I get it! User Review: "VWO is great for well defined tests"
We use VWO to split test for a range of clients across a range of B2B and B2C verticals. Rapid deployment of tests outside the normal development cycle. Perhaps, streamline multi-device/browser QA process. Clean up UX internally, as it feels a bit cluttered and I suspect many people use just the A/B testing and not the other features, as we do. It's well suited for sites with clearly delineated HTML pages, sufficient traffic, and clearly defined KPIs which are measurable via Google Analytics. It's not well suited for mobile, sites with offline conversions, lower traffic, or web applications. VWO Review: "Great tool CRO from A/B to Z ;-)"
VWO is used within Orangedotcom to analyze clients' websites and run A/B tests. Within our company, two departments make use of VWO: the SEO team and the SEA team. It helps us and our clients to get insights into how users navigate websites, and what we can do to improve their user experience. Show clickmaps and heatmaps of specific pages, so that we can see how users interact with these pages. For example, we can see which element they click on - or don't click on - and use that information to try and improve the page. Run A/B tests to find out which version of a page gets the best results. It's easy to add or delete elements, change elements' colour or size, or change certain text on a page. When we have a question, the VWO team is always very quick to respond over the chat on the website. They are friendly and super helpful. It's currently not easy to run a test on multiple pages at once. For instance to test something on 10 product pages at once. We ran out of credits used for heatmaps and clickmaps really fast, and I am not sure how this is possible. VWO could improve their user instruction/explenation on this specific subject, or create different packages that contain more credits for heatmaps in the first place. VWO is really helpful to use if you want to test different headlines, Call to Action (CTA) texts, or CTA colours. It is also appropriate when you want to find out what the ideal structure is for a page or pages, or if you want to get a clear image on how your websites pages are used. VWO Review: "Great pick for getting up to speed quickly with AB testing"
VWO is used by our e-commerce team for conversion optimization. Through VWO we create experiments to validate hypotheses aimed at business growth and customer satisfaction. We use quantitative and qualitative data to generate insights on which elements of our product and service can be improved. Next, we validate solutions through AB testing with VWO. VWO is a great entry-level tool to quickly get up to speed with AB testing. Due to the easy implementation, excellent support and a wide range of use cases and communities, a business can quickly use VWO for small to medium scale AB testing. Once your CRO program becomes more mature, in house development might be a better solution in the long run. User Review: "Why we have used VWO for many years"
VWO is being used by the marketing department to test websites in different countries that Laudius is active in. We coin a hypothesis and then set up the test through VWO. In our case, we mostly use A/B testing and split run testing. The main goal for us is to improve on mini conversions; for example: get more people from the product page to the signup page or get more people to sign up for information. Setting it up is easy. You can do it either through Google Tag Manager or directly inside the code. Support is very good; we always get a fast and in depth response. Some detailed parts of the editor are difficult to understand (regarding select parent). But after getting the explanations from the support it is solved and now we know how to set up that type of test. One test in which VWO came in very handy was when we were discussing the way the price block on the course page should be visible. We debated all possibilities, but agreed that the only way forward was to let the numbers speak. There were four or five different opinions and we decided to test them all by setting up a split run test. The outcome was surprising in terms of the best performing setup as well as the huge difference it made in terms of turnover. Another good example of a test was the name of a certain product. Several possibilities were added and there was a clear winner with a much higher conversion rate (which wasn't the name we previously had). We cannot do all tests because certain pages do not have enough traffic. It will take too long before any results will be ready. Review: "VWO is by far the most advanced tool for A/B testing"
We use VWO to track conversion funnels and perform A/B testings mainly. We use it across departments but mainly most of the VWO's features are being used by the eCommerce team. They use it to track performance, conversion and so on, whereas the product design team uses mainly the A/B testing functionality to perform tests using the inbuilt editor to make small design or text changes. It helps us decide which idea leads to more conversion and which one doesn't work. The recordings feature. It's practically useless. You have so many videos to go through to actually identify what is happening that it's a waste of time. I think it's suitable for web-based applications but I wouldn't use it for mobile apps. For mobile apps, I would use Mixpanel. Review: "VWO Is The Best When It Comes To Easy To Use, Quick, and Effective Testing Platforms"
We currently only use VWO for our e-commerce division. While it does solve intra-personal ideas on what designs work, it allows us to maximize our ability to provide a better customer experience. When we use testing, we aren't looking for little lifts in conversions but large leaps - and VWO allows us to do that easily and quickly. It is well suited for quick & dirty user interface testing! Good for changing elements around on landing pages, change pricing etc. User Review: "Ups and Downs with VWO"
We use VWO for A/B testing smaller features on site (e.g. hiding some text) and split testing with larger features (e.g. layout and image changes). It's primarily used by engineering currently, but we are trying to move priorities to product and marketing (with some constraints) for the majority of tests. It allows us to make business decisions around the wording of text that's shown, or the user experience around a new UI. UI/UX for finding certain options are confusing. Even having used the tool for a bit, can't remember where certain editing options are . Simple tests like hiding and showing a button, text, etc. User Review: "VWO is effective, but sometimes clunky"
Our marketing department uses it to A/B test new website organizations, promotions, and product page layouts. It lets us make temporary changes to our website strategy, see the effects, and then decide whether or not to commit to them on the live site for our entire audience. It's the best A/B testing solution we could find for our own website and it's mostly very good at what it does. It has some usability issues on occasion, and the interface can be clunky, so it's not the easiest thing to pick-up-and-go, despite appearances; simple changes should be easy enough for a beginner to make but it takes some time with the interface to understand all its quirks.